This is a hard question because we know quite a bit about what the termites do not do. They do not have architects and project managers; they do not have blueprints guiding their work; they do not have a master plan. Instead, millions of independent organisms somehow coordinate their actions in ways that collectively result in the large structure. We would like to have an explanation for how this works; how the individual insects within this population behave in the ways that are necessary to create this vast complex structure. One way of putting our explanatory needs here is to say that we are asking for a mechanism: what is the mechanism or ensemble of mechanisms that produce the collective behavior leading to the construction of the mound? What is it about the behavioral code of the insect that permits this collective behavior? This way of putting the problem is to highlight the mechanisms approach. The insects have such-and-so behavioral routines (algorithms) embedded in their nervous systems. Behaviors are triggered by environmental circumstances and the activities of other insects around them. The triggered behavior in each insect contributes to a pattern of activity that leads to progressive “building” of the mound. 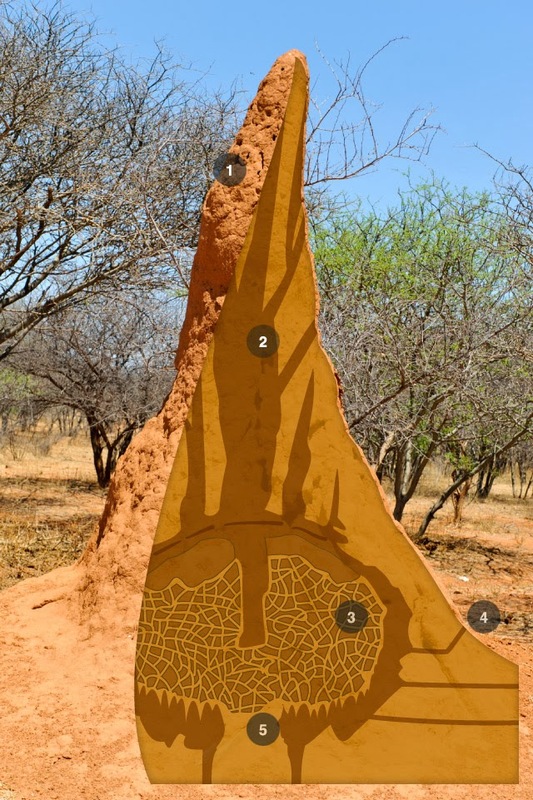 The force of the explanation hinges on the details we can learn about these powers and capacities of the termites as a species — these behavioral algorithms. We want to know something crucial about the powers and capacities of the individual insects; we want to know how their routines are responsive to environment and other insects; and we want to know how the emerging structure of the mound leads to the modified activities of the insects over the process of construction. This narrative highlights a topic we have considered several times before — the idea of the causal powers of an entity. Most basically, we might look at the individual worker termite as robot controlled by a complex algorithm — “when external circumstances X,Y,Z arise, carry out the Z routine.” The causal powers of the individual worker termite are determined by its algorithm and its physical capacities — salivation, moving around, carrying bits of mud, and so forth. And the task of explanation is to discover the nature of the algorithms and the ways in which the resulting behaviors aggregate to the observed physical structure of the mound. We might observe, for example, that a certain kind of insect navigates a maze by following a simple rule: always keep the wall on your left. This rule will sometimes work well; sometimes it will not. But this observation suggests that the insect’s central nervous system encodes the decision-making rule in this way. And we might also infer that “maze navigation” is important for the survival of the insect in its normal environment, and so its navigational algorithms will have been refined through natural selection. We would also like to know something else about the insects and their powers: how did they come to have these particular capacities and algorithms? Here we have a well established explanation, in the form of the theory of the gene, natural selection, and the evolution of species characteristics through differential reproductive success. Here the explanatory challenge is to piece together the nature of the algorithms that would suffice to account for the observed collective outcomes.It is also of interest in this example that there is a large field of research and discovery within complexity research that hinges on discovering the complex collective patterns that can emerge from simple routines at the level of the individual agent. For example, the “Game of Life” illustrates the power of cellular automata in generating complexity out of simple agent-level routines. This example is a useful one, not primarily for entymologists, but for us as philosophers of social science. What would an explanation of this phenomenon look like? And a little bit of reflection seems to take us in the direction of some familiar ideas: the idea of things having causal powers that govern what they can do, the idea of the aggregation of complex outcomes from independent activities of large numbers of agents (agent-based models), and the idea that a good explanation gives us an empirically supportable understanding of how something works.